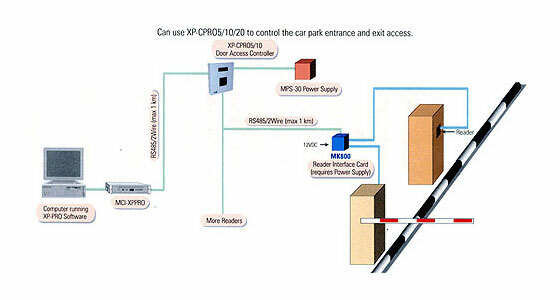 XP-CPRO5 controller can also be used as the car park controller. Each reader interface point can be used to control an entry/exit point for car park. The reader interface will be connected to the reader as well as the barrier to control the barrier arm. The XP-CPRO5 offers multi-gate anti-passback of up to 5 gates and the XP-CPRO10 can manage up to 10 gates. These gates are linked using RS485 connection and the total distance is as far as 1000m. The XP-CPRO5 control offers large card holder database. It can store up to 10,000 card holders and therefore it can cater for most of the capacity requirement. It can be linked back to the computer using xPortal2007 / xPortalNet software.